When it comes to digital analytics, we are all on our own journey of understanding. In working with more than 25 top Fortune 500 companies and distilling their most successful digital analytics projects, InfoTrust has come up with six ingredients of a successful digital analytics transformation: purpose, people, process, platforms, pace and payoff. Together, these ingredients can help you better understand where you and your company find yourselves today in your own digital analytics journey. In this webinar, we’ll review these “6 Ps” of digital analytics transformation and provide actionable items you can use to push your organization forward. Join us on Tuesday, April 23 at 1 PM EDT to learn more! 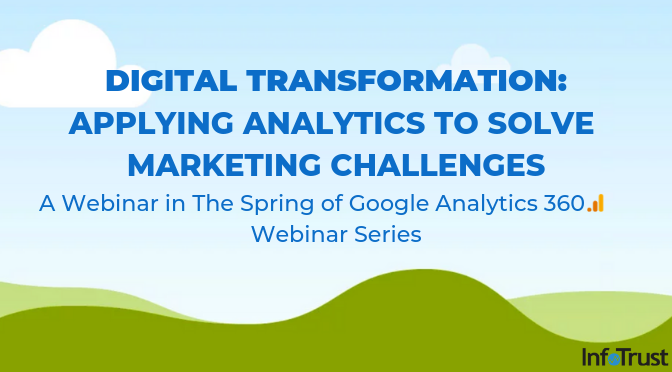 This webinar is part of InfoTrust’s “Spring of Google Analytics 360” event series. To see all webinars and live events in this series through June, click here.